This exercise will stretch the muscles required to rotate the hip outwards. Lie on your back and bend the right knee. Use the left hand to pull the knee over to the left side. Keep your back on the ground as you do so. You should feel this in the hip and buttocks. Hold the stretch for 20 to 30 seconds, repeat 3-5 times, and stretch 3 times a day. The legs’ adductor muscles are those of the inner thigh: long adductors attach the pelvis to the knee and short adductors go from the pelvis to the femur. 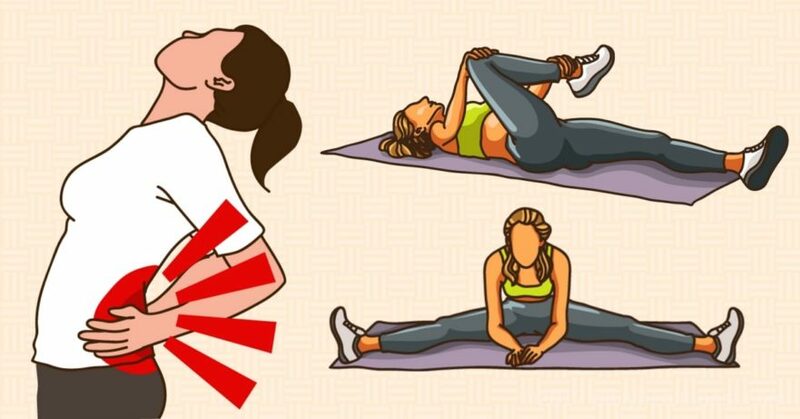 Because these muscles are connected to both the pelvis and the leg, it’s important to loosen the thighs as well as the pelvic and gluteal muscles to relieve tension in the piriformis. Sit on the floor and stretch your legs straight out, as far apart as is comfortable. Tilt slightly forward at the hips and place your hands next to each other on the floor, about a foot in front of your torso. Lean forward and drop your elbows to the floor (or as far down as you can go). You will feel a stretch in the pelvis. Hold 10-20 seconds, then release. Pause and repeat. You’ll feel this stretching exercise at the top of the inner thigh. If you can’t yet put your feet together, place them as close together as you comfortably can and be careful with the angles of your knees. As you incorporate it into your routine, you’ll be able to move your feet closer to your body for a more intense piriformis stretch. Use your elbows to apply a gentle downward pressure to your knees to increase the stretch. You should feel a stretch on the inside of the thigh. For a deeper stretch, lean forward, keeping your back straight. Hold this position for 30 seconds. Release and flutter your legs for 30 seconds. Repeat 3-5 times in a row and stretch 3 times a day.